In your hands, a silk scarf suddenly appears inside an empty Coke bottle! Easy to do and definitely amazing! If you can put the Pringles can over the Coke bottle, you can do the trick! You'll get a lot of use out of this one, because you can do it in a number of different ways. Produce the silk scarf from nowhere. Or first put a scarf into your pocket, then magically make it travel invisibly to reappear inside the Coke bottle. Our version of the wonderful classic magic trick has been updated to use real products from the grocery store shelves! 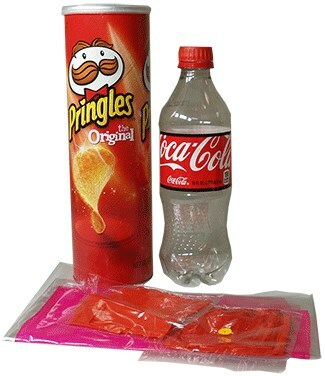 You'll get a REAL Pringles can plus a REAL plastic Coke bottle! And since it's plastic, you don't have to worry about it breaking if you drop it.